ROCKVILLE, Md., Oct. 29, 2018 /PRNewswire/ -- The Comfort brand transformation journey continues with the opening of the Comfort Suites in Brunswick, a new construction, 84-room hotel located at 1464 Town Center Boulevard. The hotel is the latest to receive signage with the new Comfort logo, signaling the brand's refreshed look and feel with modernized guest rooms and common areas. "The Comfort Suites hotel opening in Brunswick illustrates our commitment to innovate as guest preferences evolve. This new hotel delivers on our promise to provide guests with a refreshing experience and amenities that exceed their expectations," said Anne Smith, vice president, brand management, design and compliance, Choice Hotels. "Our $2.5 billion investment in the brand alongside our franchisees is driven by the Move to Modern initiative. Soon enough, guests will be able to experience the new Comfort brand across the country." The new Comfort Suites hotel in Brunswick is conveniently located near Interstate 71, providing guests with an easy route to Cleveland and Akron, Ohio. The hotel is also near popular neighborhood attractions, including Gardenview Horticultural Park, Susan Hambley Nature Center, Scene75 Entertainment Center, and the Heritage Farm Museum and Park. The new hotel features several complimentary amenities, such as Wi-Fi, a hearty and healthy hot breakfast with the brand's signature waffles, airport transportation, meeting space, and a fitness center. "With nearly 40 years of leadership and expertise in the upper-midscale segment, the Comfort brand continues to serve the needs of guests and franchisees in key markets," said Brian Quinn, vice president, head of development, new construction brands, Choice Hotels. "The new Comfort Suites hotel in Brunswick, which is right outside Cleveland, builds on our expansion strategy across North America, joining recent Comfort hotel openings in Asheville, N.C. and Austin and Dallas, Texas. Our pipeline is nearly 300 properties strong, 80-percent of which are new construction, as the brand expands in cities where owners want to build and guests want to stay." 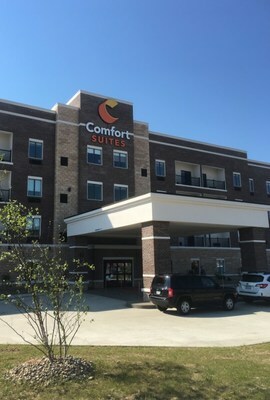 The Comfort Suites hotel in Brunswick was developed by Choice Hotels' 2016 Developer of the Year Award winner, Robert Schlabach of Brunswick Hospitality, LLC. His company currently owns 18 Choice hotels, including those under the Comfort, Sleep Inn, MainStay Suites, and Ascend Hotel Collection brands. Most recently, the two companies opened a dual-branded Sleep Inn and MainStay Suites property in Sarasota, Fla.
"Brunswick is experiencing strong growth, which is evidenced by retail operations, manufacturing, and new businesses entering the area. This, along with the Comfort brand's new look and amenities, make the Comfort Suites in Brunswick a great addition for the community and travelers alike," said Robert Schlabach, managing partner, Brunswick Hospitality, LLC. "This hotel marks another successful collaboration with Choice Hotels, and we can't wait for guests to walk through the doors for a best-in-class experience." For more information on Comfort hotel development opportunities, visit https://choicehotelsdevelopment.com/comfort/. Choice Hotels International, Inc. (NYSE: CHH) is one of the largest and most successful lodging franchisors in the world. With more than 6,800 franchised hotels, representing more than 550,000 rooms, in over 40 countries and territories as of June 30, 2018, the Choice® family of hotel brands provide business and leisure travelers with a range of high-quality lodging options from limited service to full-service hotels in the upscale, midscale, extended-stay and economy segments. The award-winning Choice Privileges® loyalty program offers members benefits ranging from everyday rewards to exceptional experiences. Comfort, Comfort Inn, Comfort Inn & Suites, Comfort Suites, Sleep Inn, MainStay Suites, and Ascend Hotel Collection are registered trademarks of Choice Hotels International. For more information, visit www.choicehotels.com. This is not an offering. No offer or sale of a franchise will be made except by a Franchise Disclosure Document first filed and registered with applicable state authorities. A copy of the Franchise Disclosure Document can be obtained through contacting Choice Hotels International at 1 Choice Hotels Circle, Suite 400, Rockville, MD 20850, development@choicehotels.com.